There’s a bloke called David Dean Burkhart who is such a monster fan of New York electro pop group Ra Ra Riot that he created his own video for the title track from their new album. The record label was so understandably impressed; they got in touch with Burkhart and said they wanted to make it the official music video for Beta Love. Burkhart edited together footage from a local 1980s Bay Area UHF show called Dance Party, creating a visual treat consisting of then dancing teenagers whose children must now be contemplating filing emancipation papers. Honestly, the video plays like some bizarre junior UN convention from yesteryear where the punch got spiked and caused its young delegates to grin and dance like maniacs. The kids look so beautifully smiley, it’s infectious. The video works brilliantly, making a rather slight music number instantly memorable. It works so well that you may replay it all afternoon, e-mailing it endlessly to everyone. Remarks by fans of the band indicate that much of the irony of this clip has been lost on them, which is a shame because its tongue is firmly in cheek. It’s both embarrassing and endearing at once. Culturally, the British love things like this. In order to make a few quid on the fly, those of us in Britain should mimic Burkhart’s methods and convince a record company to splice their act’s music with infamous footage of Hit Man and Her. The results could be legendary. 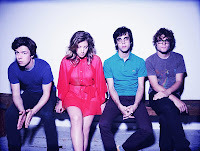 I love Ra Ra Riot and that's a cool video. Talk about nostalgic. LOL I got so uncomfortable watching this. And, dancing with a toothpick is SO dangerous! But I liked the song. It made me smile in a I'm so uncomfortable, but not too uncomfortable to leave kind of way.